This article is about the music festival. For series of themed parks, see Tomorrowland. For other uses, see Tomorrowland (disambiguation). 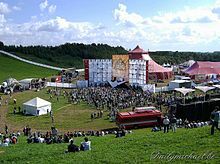 Tomorrowland is an electronic dance music festival held in Boom, Belgium. Tomorrowland was first held in 2005 and has since become one of the world's largest and most notable music festivals. It now stretches over 2 weekends and usually sells out in minutes. The first edition of the festival took place on 14 August 2005. Manu Beers, Michiel Beers and ID&T organized the festival. Performers included Push (M.I.K.E. ), Erwin Tang Yew Hon, Armin van Buuren, Cor Fijneman, Yves Deruyter, Technoboy, Yoji Biomehanika and Coone. 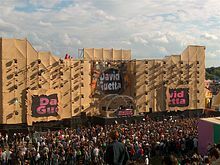 The second festival, on 30 July 2006, hosted Armin van Buuren, Axwell, Marco Bailey, Fred Baker, David Guetta, Ruthless and DJ Zany. The DJ and producer Paul Oakenfold was also announced on the poster, but canceled at the last moment, as he was on tour with Madonna at the time. Emjay, the producer of 'Stimulate', the anthem of 2006, performed on the main stage with The Atari Babies. The third year, the festival lasted two days for the first time in its history, taking place on 28 and 29 July 2007. In 2008, the festival took place on 26 and 27 July. For the first time, more than 100 DJs participated. The number of visitors exceeded 50,000 for the first time. For the fifth event, ID&T led to even more venues, one ski, and much more. Sun[who?] has included an "I Love the 90's" stage, where musicians such as Push, Natural Born Deejays and SASH from the dance scene were present. La Rocca performed live at the event for the first time. The special act on the main stage was Moby. 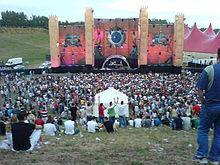 Tomorrowland 2009 took place on 25 and 26 July and attracted 90,000 people. The festival saw the use of a theme for the first time - Masker (Mask). Tomorrowland sold out days before the event, with a record attendance of 120,000 visitors over two days, in 2010 Dada Life, Dimitri Vegas & Like Mike and Tara McDonald wrote the official anthem "Tomorrow/Give Into The Night", performing the song twice on the main stage after Swedish House Mafia. The track was made by Like Mike, Dada Life and Dimitri Vegas and the vocal melody and lyrics were written and recorded by Tara McDonald. The song reached number 5 in the Belgian commercial charts and is the biggest selling anthem for Tomorrowlands to date. The festival's theme was "Zon (Sun)" and was nominated for the Best Music Event by the International Dance Music Awards in 2011. 2011 marked the festival's expansion to three days occurring on 22, 23, 24 July. Tomorrowland 2011 had the theme "The Tree of Life" and the anthem "The Way We See The World" by Dimitri Vegas & Like Mike featuring Afrojack and Nervo. Only a few days after the official pre-sale of tickets kicked off Tomorrowland was completely sold out and had over 180,000 visitors. David Guetta, Nervo, Swedish House Mafia, Avicii, Tiësto, Hardwell, Carl Cox, Paul van Dyk, Tensnake, Laidback Luke, Brodinski, Juanma Tudon, Mike Matthews, De Jeugd van Tegenwoordig, and dozens of others performed. It was voted the Best Music Event by the International Dance Music Awards for the first time in 2012. Tomorrowland 2012 took place 27, 28, 29 July 2012, at the De Schorre, a provincial recreation area in Boom, Belgium, 16 kilometers south of Antwerp and 32 kilometers north of Brussels. The line-up consisted of 400 DJs, such as Armin van Buuren, Ferry Corsten, Skrillex, Avicii, Marco Bailey, Skazi, David Guetta, Nervo, Hardwell, Swedish House Mafia, Afrojack, Steve Aoki, Juanma Tudon, Carl Cox, The Bloody Beetroots, Paul van Dyk, Martin Solveig, Chuckie, Fatboy Slim, Dimitri Vegas & Like Mike and Pendulum playing on fifteen stages each day. 185,000 people from over 75 countries around the world were in attendance, with 35,000 of them staying in Dreamville. Because of the enormous success of Tomorrowland and the fact that it is a Belgian festival, ID&T decided to give Belgians an exclusive chance with a pre-sale (80,000 of the 180,000 tickets) on March 24. In less than one day, all of the tickets sold out and at some moments there were 2,000,000 people on the online waiting list. The worldwide sale started April 7. Within 43 minutes, the other 100,000 tickets sold out. In addition to regular tickets, Tomorrowland partnered with Brussels Airlines to provide exclusive travel packages from over 15 cities around the world. Other highlights of the festival were the Cloud Rider, the highest mobile Ferris wheel in Europe, and the fact that 25 airlines were organized to bring spectators to the festival from all over the world. The festival's theme was "The Book of Wisdom" and had the anthem "Tomorrow Changed Today" by Afrojack, Dimitri Vegas & Like Mike, and Nervo. The festival again won the International Dance Music Awards in 2013 for the Best Music Event. Tomorrowland 2012 also won the DJ Award for the Best International Dance Music Festival. Tomorrowland 2013 took place on 26 27 28 July and reached 180,000 attendees at De Schorre in Boom, Belgium. Full madness passes sold out in 35 minutes, and the remainder of tickets sold out in a reported one second. Tomorrowland again offered its Global Journey packages with Brussels Airlines which had 140 additional flights from 67 different cities around the world transporting festival goers with 214 different nationalities to Boom, Belgium. The anthem for Tomorrowland 2013 was "Chattahoochee" by Dimitri Vegas & Like Mike featuring Maarten Vorwerk. This year's edition with the theme "The Arising of Life" saw performances from Axwell, Armin van Buuren, Hardwell, Afrojack, David Guetta, and Sebastian Ingrosso. To celebrate the 10th anniversary of the festival, and to meet the high demand for tickets, the 2014 edition of Tomorrowland would be held over two weekends; 18–20 July and 25–27 July. The line-up for both weekends would be more or less the same. In April 2014, MTV announced that it would produce two hour-long MTV World Stage specials featuring performances from the festival (to be aired in August 2014), and that it would produce a documentary surrounding the 10th anniversary of Tomorrowland. On April 16, composer Hans Zimmer and Tomorrowland announced that they combined forces for the creation of a classical hymn that would premiere during the 10th anniversary edition of Tomorrowland. Veteran DJ Dave Clark, who hosted the second largest stage, believes that “a more diverse lineup that covered a wider range of underground music” was Tomorrowland 2014's top selling point. Dimitri Vegas & Like Mike again were responsible for the Tomorrowland anthem, this year working with W & W for the song "Waves". 360,000 people attended Tomorrowland 2014 which won the International Dance Music Award for Best Global Festival during the ceremony in March 2015. Tomorrowland 2015 has taken place on 24, 25, and 26 July 2015 and saw 180,000 visitors. The theme for the year was "The Secret Kingdom of Melodia". Performers included Avicii, Hardwell, David Guetta, Tiësto, Armin van Buuren, and Carl Cox. The 2016 edition of the International Dance Music Awards awarded the Tomorrowland 2015 the Best Global Festival for the fifth consecutive year, and the readers of DJ Magazine voted Tomorrowland 2015 the World's Best Festival. Tomorrowland 2016 took place on 22, 23, and 24 July. The theme for the year was "The Elixir of Life" and saw 180,000 visitors. The 2016 edition of Tomorrowland saw a surprise set from Tiësto on the Thursday prior to the weekend and was sponsored by Budweiser. Other performers included Axwell Λ Ingrosso, Martin Garrix, The Chainsmokers, and number one DJs Dimitri Vegas & Like Mike. The 2018 edition of Tomorrowland saw an attendance of 400,000 people for the second year running across the two weekends. The festival took place on Friday 20 to Sunday 22 July and Friday 27 to Sunday 29 July with tickets for the two weekends selling out in an hour. Mainstage performers included Armin van Buuren, David Guetta, Dimitri Vegas & Like Mike, Hardwell, and Martin Garrix! The theme for the 2018 edition of the festival was "The Story of Planaxis". Tomorrowland 2018 also saw a lot of Avicii tributes to commemorate the death of the Swedish DJ three months prior to the festival. Avicii's songs "Levels" and "Wake Me Up" came second and eighth respectively in Tomorrowland 2018's most played songs. Tributes to the DJ came from Axwell Λ Ingrosso, Don Diablo, Nicky Romero, and Dimitri Vegas & Like Mike. Digital Spy described the event as "the most elaborate festival on earth" with the only downside being the price. On March 20, 2013, ID&T Belgium and SFX Entertainment announced that it would begin organizing an American spin-off of Tomorrowland, known as TomorrowWorld. The festival is held at the Bouckaert Farm in Chattahoochee Hills, Georgia, located 48 kilometers (30 miles) southwest of Atlanta. The site was specifically chosen due to its resemblance to the Boom location in which Tomorrowland is traditionally held. The inaugural edition of TomorrowWorld, held 27–29 September 2013, reused the "Book of Wisdom" design used for the main stage at Tomorrowland in 2012. The festival played host to over 140,000 attendees over the weekend. TomorrowWorld brought more than music, dancing and stunning visuals to the area that year - it brought an economic boost. Officials reported TomorrowWorld 2013 brought $85.1 million into the Georgia economy, including $70 million directly to Atlanta. That $70 million matches the impact the city got from hosting the NCAA Final Four in 2013. Nearly 140,000 attended the event, and their direct expenditures added $28.7 million into the local economy in areas such as lodging, restaurants and sight-seeing, TomorrowWorld officials said. The 2014 edition of TomorrowWorld was held on 26-27–28 September 2014. The theme was "The Arising of Life," and used the volcano main stage which debuted at Tomorrowland in 2013. The festival hosted a pre-festival concert called "The Gathering" on Thursday 25 September 2014 for attendees staying in Dreamville, the camp grounds of TomorrowWorld. Over 40,000 people camped at Dreamville, selling out the basic camping option. More than 160,000 people attended TomorrowWorld 2014. The third and final edition of TomorrowWorld was held on the weekend of September 25, 2015. The event descended into chaos after being marred by inclement weather. Rain showers resulted in muddy terrain at the festival grounds, and entrance roadways to the grounds becoming unusable. On Saturday, due to the road conditions, organizers restricted shuttle service for attendees traveling back to Atlanta; those who were not stranded without shelter at the grounds overnight were required to hike miles towards areas where taxi cab and Uber drivers offered rides back to Atlanta at high prices. The following morning, festival organizers announced that the remainder of the festival would only be open to those who had camped on-site, and that refunds would be issued to those who were affected by the transport issues or had bought tickets for day 3. On March 2, 2016, the official TomorrowWorld Facebook page announced that the festival will not be held in 2016. As announced on July 20, 2014, by David Guetta's streamed Tomorrowland set to Brazil, and on the Tomorrowland website, the next edition to Tomorrowland Brasil was held on May 1–3, 2015 in Itu, São Paulo. Various DJ's performed such as W&W, Hardwell, Iraj and Naveen Attygalle, Dimitri Vegas & Like Mike, Showtek, Steve Aoki, and many more main stage performers. Some of the stage hosts were Revealed Recordings, Dim Mak, Smash The House, Q-Dance, Super You & Me and many more. The mainstage again reused the "Book of Wisdom" theme. All 180,000 tickets sold out one day after being announced. The second edition of Tomorrowland Brasil took place once again at Itu in São Paulo, Brasil during April 21–23, 2016. The lineup included Axwell & Ingrosso, Ferry Corsten, Laidback Luke, Loco Dice, Markus Schulz, Afrojack, Alesso, Armin van Buuren, Chris Lake, Infected Mushroom, Nicky Romero, Dimitri Vegas & Like Mike, Solomun, Steve Angello, and many others. In November 2016, it was announced that Tomorrowland Brasil would not return due to concerns over the country's economic stability. In March 2018, Tomorrowland announced the coming of a new festival, Tomorrowland Winter, to take place annually during the second or third week in March in Alpe d'Huez in the French Alps. 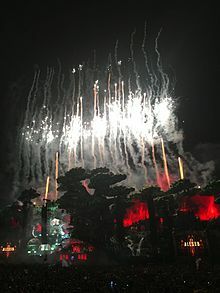 The first Tomorrowland Winter took place between 9 and 16 March 2019 and used the theme "The Hymn of the Frozen Lotus". It featured Martin Garrix, Dimitri Vegas & Like Mike, Armin van Buuren, Martin Solveig, Afrojack, DJ Snake, Steve Aoki and others. For the participants, the choice of 4 or 7 day passes were available for packages including accommodation and skiing. Tomorrowland has also organized Unite with Tomorrowland events in other countries, which serve as a satellite link to the main event in Belgium featuring live streams from the festival with synchronized effects, joined by in-person headliners. Unite with Tomorrowland currently operates in the United Arab Emirates, Germany, Spain, Lebanon, Taiwan, Malta, South Korea, and Israel. On 29 July 2017, the Unite event in Parc de Can Zam, Barcelona, Spain was cut short after the stage caught fire due to a "technical malfunction" causing over 22,000 people to be evacuated. Firefighters on the scene hypothesised that the fire was caused by a failed pyrotechnics display however this was never officially confirmed. Twenty five percent of the stage was destroyed and twenty people were treated for minor injuries or anxiety. “Saturday night July 29th 2017, the UNITE Barcelona stage caught fire due to a technical malfunction. Thanks to the professional intervention of the authorities all 22.000 visitors were evacuated safely and without reports of injuries. Local authorities will follow up and continue the investigation together with the Spanish organisation of UNITE." A Brussels Airlines plane at Manchester Airport with promotional Tomorrowland paintwork. Tomorrowland currently has twenty six official partners including Pepsi Max, Budweiser, and Brussels Airlines which do various work to promote the festival. Since 2011, Tomorrowland has been filming the event and posting the sets on YouTube. The filming is also used to make an official aftermovie in which extra emphasis is put on the festival goers aiming to expand ticket sales for the following year. The film crew is made up of about 200 editors, producers, and camera people. Tomorrowland's YouTube channel has 37.4 million views and over 250,000 likes as of August 2015, and over 7.2 million subscribers as of September 2018. Elsewhere on social media, Tomorrowland has over 6 million followers on Instagram, and over 2.4 million followers on Twitter. The 2012 edition of Tomorrowland saw the debut of the Tomorrowland's Global Journey packages in partnership with Brussels Airlines. The package includes a weekend ticket in addition to fights and hotels and saw 25 flights carrying 2,000 passengers from 17 departure cities. 2013 saw a large increase in popularity for this package seeing 140 flight carrying 8,000 passenger from 67 cities with the top five flight destination being Basel, Tel Aviv, Geneva, Oslo, and London. Buyers of the Global Journey packages had the option to upgrade to party flights of which there were twenty, ten standard, eight with streamed music and two with live DJ sets. Previous Global Journey setlists have come from Dimitri Vegas & Like Mike, Yves V, and Romeo Blanco. Since 2017, Tomorrowland has been partnered with Dance FM UAE allowing live setlists from the festival and exclusive interviews with the performers to be broadcast on the station. Tomorrowland 2013 brought €70 million to the Belgian economy, €19 million of which was spent by people living outside of Belgium. In 2016 the festival brought €100 million and employed 700 people full-time before and during the festival. 2017 reported a similar value, again bringing €100 million to the local economy but this year employing a reported 12,000 people during the festival. ^ "A Look Inside Tomorrowland: 'It's Beyond a Festival'". pollstar.com. 18 July 2018. ^ "The Top 12 Music Festivals in the World". Festivalfling. Retrieved 14 April 2013. ^ "7 Top Music Festivals Around The World - Tripoetic Blog". Tripoetic Blog. 2017-01-31. Retrieved 2017-02-23. ^ "History - Tomorrowland - Events - Elekedia". Retrieved 14 December 2012. ^ a b c d e Menon, Dhriti (23 July 2014). "The 5 Tomorrowland Anthems Worth Reliving". Festival Sherpa - Online Guide to Festivals. Retrieved 28 January 2019. ^ "27th Annual International Dance Music Awards Nominees and Winners". 2012-03-22. Archived from the original on 2017-06-22. Retrieved 2012-11-30. ^ a b c "Brussels Airlines brings 8,000 festival-goers to Tomorrowland". Brussels Airlines. 2013-07-25. Retrieved 2013-12-09. ^ "Touch the sky?". tomorrowland.be. 2012-07-19. Retrieved 2012-11-30. ^ "Brussels Airlines welcomes 25 flights with visitors for Tomorrowland". Brussels Airlines. 2012-07-26. Retrieved 2012-11-30. ^ a b "2012". Retrieved 28 January 2019. ^ "TOMORROWLAND 2013 SELLS OUT IN SECONDS… LITERALLY!". ^ "MTV to Televise Dance Music Fest Tomorrowland". Variety. Retrieved 3 April 2014. ^ Dave Clark Isn't Going to Stop Breaking Boundaries at Tomorrowland Popspoken. Retrieved on 2014-09-09. ^ "TOMORROWLAND VOTED AS THE WORLD'S NO.1 FESTIVAL". DJMag.com. 20 May 2015. Retrieved 28 January 2019. ^ Daly, Rhian (25 July 2016). "Tomorrowland 2016: The Most Euphoric Moments". NME. Retrieved 28 January 2019. ^ "Tomorrowland 2016 Releases Full Phase One Lineup: Tiësto, Martin Garrix, The Chainsmokers & More". Billboard. Retrieved 28 January 2019. ^ Di, Marco (16 March 2017). "Tomorrowland 2017 releases the full lineups for a number of the stages". ^ "Tomorrowland 2017 Builds on Amicorum Spectaculum Theme With Cinematic Trailer: Watch". Billboard. Retrieved 2017-07-30. ^ "Tomorrowland 2017 Claims Title of Biggest Social Media Music Event Ever With Over 1 Billion Views". www.billboard.com. Retrieved 28 January 2019. ^ "Tomorrowland 2018 Sells Out Two Weekends of Tickets in One Hour". www.billboard.com. Retrieved 28 January 2019. ^ "Avicii Remembered by Axwell & Ingrosso, Hardwell and More at Tomorrowland 2018". www.billboard.com. Retrieved 28 January 2019. ^ "Multiple Avicii tributes at Tomorrowland honour the late EDM star". DJMag.com. 23 July 2018. Retrieved 28 January 2019. ^ "These were the most played tracks at Tomorrowland 2018". DJMag.com. 1 August 2018. Retrieved 28 January 2019. ^ Powell, Karlie (1 August 2018). "The 10 Most Played Songs of Tomorrowland Revealed [LISTEN HERE]". Retrieved 28 January 2019. ^ Mozafari, Laurence (30 July 2018). "Tomorrowland review - most elaborate festival on Earth?". Digital Spy. Retrieved 28 January 2019. ^ ARMIN VAN BUUREN BRINGS ASOT TO TOMORROWLAND 2017! ^ "A$AP Rocky, The Chainsmokers and More Set For Tomorrowland 2019". Billboard. Retrieved 2019-01-31. ^ Meadow, Matthew (2019-01-28). "BREAKING: Tomorrowland Reveals First Artists for 2019 Festival". Your EDM. Retrieved 2019-01-31. ^ Meadow, Matthew (2019-01-29). "Tomorrowland Reveals Second Round Of Artists For 2019". Your EDM. Retrieved 2019-01-31. ^ "SFX Purchases 75% Stake in ID&T, Announce U.S. Edition of Tomorrowland at Ultra". Billboard.com. 2013-03-21. Retrieved 2014-08-21. ^ "Tomorrow World Is Coming To Atlanta". Business Insider. 2013-06-04. Retrieved 2014-08-21. ^ "EDM Survive Beyond 2017? --Miami New Times". Retrieved 28 January 2019. ^ "Tomorrowland Brasil 2016 Announces Full Lineup". Billboard. Retrieved 2017-01-16. ^ "Tomorrowland Brasil cancelled for 2017; TomorrowWorld in question as well - Dancing Astronaut". www.dancingastronaut.com. Retrieved 2017-01-16. ^ "Tomorrowland Announces Winter Festival in France 2019: Watch". www.billboard.com. ^ Meadow, Matthew (2019-03-15). "Martin Garrix, Steve Aoki & More Close Out Tomorrowland Winter 2019 [LIVE STREAM]". Your EDM. Retrieved 2019-03-17. ^ "Tomorrowland announces theme for winter edition, The Hymn of the Frozen Lotus". DJMag.com. 2018-08-08. Retrieved 2019-02-21. ^ "Tomorrowland headliner DJ Martin Solveig: 'Labels are for canned food, not for music'". The National. Retrieved 2017-07-30. ^ "UNITE With Tomorrowland: Pre-Registration Now Open - Festicket Magazine". Festicket. Retrieved 28 January 2019. ^ "Tomorrowland Unite Fire: 22,000 Attendees Evacuated at Barcelona Festival". Billboard. Retrieved 2017-07-30. ^ "Thousands evacuated after huge fire breaks out at Barcelona festival". The Independent. 29 July 2017. Retrieved 28 January 2019. ^ "Report: Thousands Evacuate Tomorrowland UNITE After Stage Catches On Fire". The FADER. Retrieved 28 January 2019. ^ by Stephen Jones, Patrick Lion; 21:44, 29 Jul 2017Updated22:52 (29 July 2017). "Music festival evacuated after huge fire breaks out on stage". mirror. Retrieved 28 January 2019. ^ "22,000 music fans evacuated after huge fire breaks out on stage at the Tomorrowland". The Sun. 29 July 2017. Retrieved 28 January 2019. ^ "At Least 20,000 Flee Concert as Stage Burns". www.voanews.com. Retrieved 28 January 2019. ^ "Tomorrowland Issues Statement on Stage Fire at Barcelona Festival". www.billboard.com. Retrieved 28 January 2019. ^ "Tomorrowland". www.tomorrowland.com. Retrieved 28 January 2019. ^ a b Pajaro, Indro (21 July 2018). "Inside the fairy tale festival: how does Tomorrowland work?". Retrieved 28 January 2019. ^ Hong, Julie. "Coachella, Tomorrowland, Bonnaroo & More: How Top Music Festivals Use Social Media". blog.hubspot.com. Retrieved 28 January 2019. ^ "YouTube". www.youtube.com. Retrieved 28 January 2019. ^ "Tomorrowland (@tomorrowland) • Instagram photos and videos". www.instagram.com. Retrieved 28 January 2019. ^ "Tomorrowland (@tomorrowland) on Twitter". mobile.twitter.com. ^ "Global Journey". www.tomorrowland.com. Retrieved 28 January 2019. ^ "Tomorrowland Global Journey Packages with Party Flight Set to Fly". 30 January 2018. Retrieved 28 January 2019. ^ "Tomorrowland Belgium 2018 - Dance FM 97.8". Retrieved 28 January 2019 – via dancefm.com. ^ Schulze, Elizabeth (2 August 2017). "At Tomorrowland music festival, luxury can be a main event". CNBC. Retrieved 28 January 2019. ^ "TOMORROWLAND VOTED AS THE WORLD'S NO.1 FESTIVAL". djmag.com. May 20, 2015. ^ "Tomorrowland, Pearl Jam on Shortlist for European Festival Awards". Billboard. Retrieved 28 January 2019. ^ "Festicket Awards 2016 Winners: Tomorrowland, Martin Garrix, Radiohead and More - Festicket Magazine". Festicket. Retrieved 28 January 2019. ^ "Taylor Swift Leads MTV EMAs With 9 Nominations". Billboard. Retrieved 28 January 2019. ^ "Justin Bieber & Beyoncé Lead The 2016 MTV EMA Nominations – See The Full List! - MTV UK". www.mtv.co.uk. Retrieved 28 January 2019. ^ NME (27 September 2016). "Beyoncé, Justin Bieber and Adele lead 2016 MTV European Music Award nominations". NME. Retrieved 28 January 2019. ^ "Red Bull Elektropedia | Red Bull Elektropedia". Redbullelektropedia.be. Retrieved 2014-08-21. ^ "Creamfields and Glastonbury win at UK Festival Awards". 12 January 2014. Retrieved 28 January 2019. Wikimedia Commons has media related to Tomorrowland (festival).